Amazing photos of millions of spiders blanketing flooded Wagga Wagga in webs, escaping to higher ground. 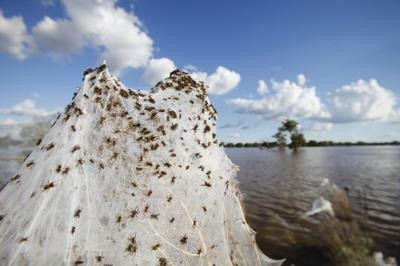 PHOTOS: Millions of spiders displaced by floodwaters in Wagga have moved to higher ground to spin their webs, covering the deserted city in a blanket of powder white silk. While residents have evacuated the city, Wagga Wagga’s other inhabitants have come out to play. Spiders have been forced to move from their low lying natural habitation to escape rising waters and are now taking over the deserted city. Armies of spiders have begun spinning their webs over dry sticks, moored boats and grassy hills, covering entire fields in their webs as they take advantage of the peace and quite before the 9,000 evacuated Wagga residents return.